Our brother James’ weekend morning usually starts with a large glass of iced coffee and a breakfast sandwich. Over the years, we have whipped up many variations on the classic egg sandwich from an Italian inspired pesto frittata on a crusty baguette in to a Spanish inspired Bocadillo de Tortilla (a potato and egg omlette between two slices of bread). Having the opportunity to cook for our brother while on Martha’s Vineyard, we decided to amp up his favorite morning dish. 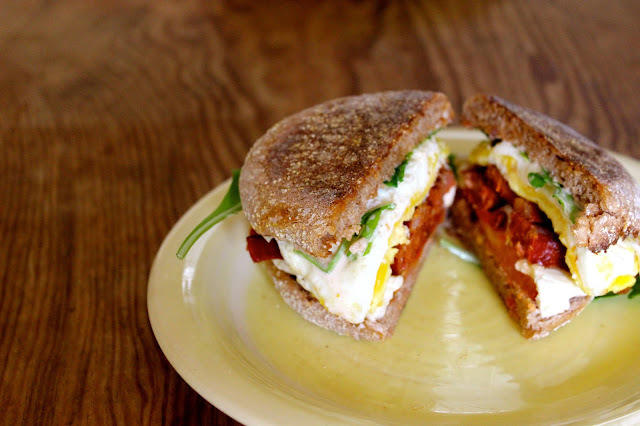 We layered a classic fried egg atop smoky chorizo, with melty mozzarella, peppery arugula and a spicy aioli. The breakfast of champions before a relaxing day at the beach. Meanwhile, add the butter, 1/2 T at a time to the same skillet on medium heat. Once the butter has melted and sizzles, crack an egg into the pan. Season with salt and pepper and fry to desired doneness. Repeat with the remaining eggs and butter. Top each chorizo and mozzarella-covered toast with a fried egg, a heap of arugula, and salt and pepper. Slather the top halves of the English Muffins with a dollop of Fiery Aioli and cover the sandwich. Cut in half and serve. Serves 4.